I think everyone, at some point or another, dreams of having a fairy tale wedding with soft flowing silk curtains, perfectly appointed tables and chairs in opulent fabrics with twinkling lights and roses everywhere you look. Whether in a church, on a beach, in a field, or the woods, when starting to plan a wedding, the big dreams come out, as does the high price tag. The current round of On9 has Spring weddings in mind, leading to the newest creation from Aphrodite, the Romantic Wedding Set! 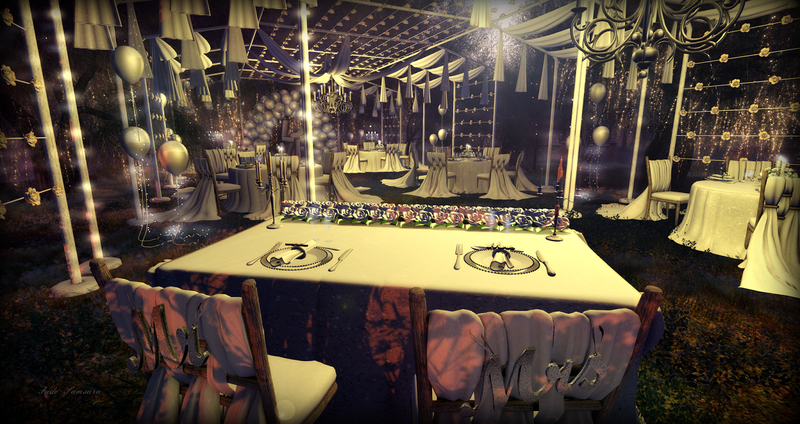 The set comes with a complete set, pictured above, with a land impact of 631, with plenty of seating for your closest friends and family; as well as a smaller set with a land impact of only 384, that still manages to include the balloon archway, trellis tent and table with special chairs for the new couple. The set is color change upon touch, making it perfect for any wedding you happen to be planning this Spring and Summer! So hurry on over to On9, which recently opened and pick up yours today, and make sure to check out the Swan Fountain that happens to be an exclusive gift at the event. Create your special, enchanted evening with no budget in mind with the Romantic Wedding Set from Aphrodite! Have a wonderfully wicked rest of your day and remember to always stay true to your style and make today’s trends in fashion and home design work for you!